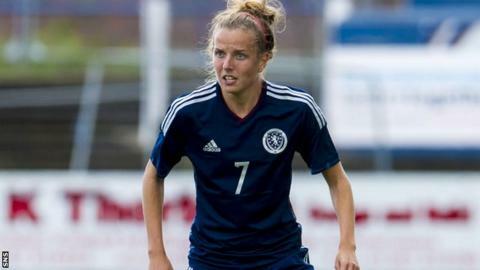 Glasgow City have signed Scotland star Hayley Lauder from Swedish side Vittsjo GIK. The 24-year-old forward joins the domestic treble winners ahead of their Uefa women's Champions League last eight tie against Paris St-Germain. "Once it became apparent that Hayley was interested in joining us, we very quickly moved to seal her signature," said Glasgow boss Eddie Wolecki Black. "There are many positives to the signing of Hayley." "I'm looking forward to getting started with a new challenge with the team in January, for what will be a very exciting season for the club." And he added: "She is an undoubted talent, she knows the league well, can play in a variety of positions and is familiar with a lot of her team-mates from being on international duty together. I am sure Hayley will add quality to our play and I look forward to working with her." Lauder started her career at Spartans before moving to Apollon Limassol, where she played in the Champions League. She has had spells at Aland United in the Finnish League and most recently with Mallbackens IF and Vittsjo in the Swedish top flight. Lauder said: "To get to the last eight of the Champions League is a fantastic achievement and only adds to the successes of the club over recent years. "I'm looking forward to getting started with a new challenge with the team in January, for what will be a very exciting season for the club. I hope I can add to the team's success."